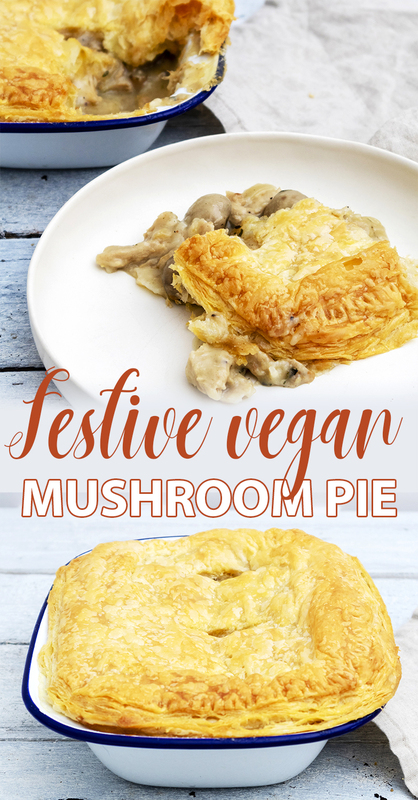 Aaaand the theme of Vegan Christmas Day Recipes continues – this time I’m showing you my Vegan Mushroom Puff Pie Recipe! You can probably tell that I’m already super excited about Christmas – I totally have to admit that I’ve been listening to Christmas music today already, but well! I’ve been meaning to create vegan pie recipes for ages and I’ve recently finally purchased some pie dishes, so that could make that plan reality (Thanks Lakeland!). 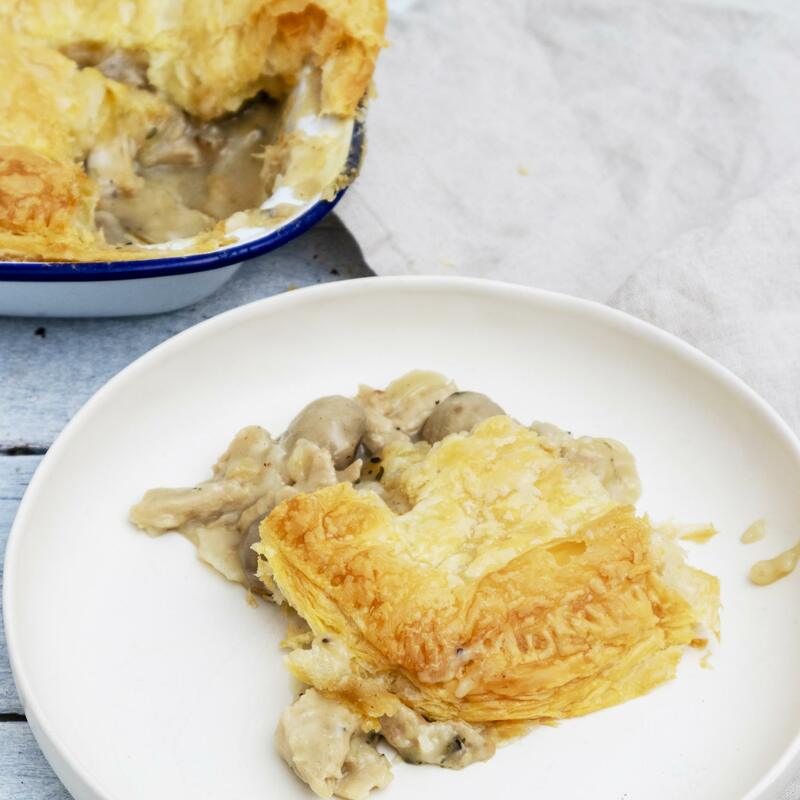 In this pie recipe I have used ready-rolled puff pastry – but of course feel free to create it from scratch if you’re up for it! Melt 1 Tbsp of vegan butter in a large, non-stick frying pan. Add in a sliced onion and 1 crushed garlic clove, then add in the 280g of Oumph! The Chunk. Fry everything until the onions turn golden and the Oumph! is starting to lightly brown around the edges, turn occasionally. Sprinkle 2 Tbsp of plain flour into the pan and stir for roughly 1 minute. Take the pan off the heat and stir in 400ml Vegetable stock, followed by 200ml of almond or oat milk. Stir well with a whisk or fork, then tip in the button mushrooms & thyme sprigs. Bring everything to the boil and let it simmer for around 20 minutes. Heat your oven to 220C/fan 200C/gas. Unroll your pastry sheet on a lightly floured surface, gently place your pie dish upside down on the pastry and use a small sharp knife to cut around the edges or the pie dish to get a fitting pastry size. Once ready cooked, remove the thyme sprigs from your pan, add the black pepper and stir. Then gently transfer the contents of the pan into the pie dish. Top with the pastry sheet – ideally hold it in one hand and then start covering the pie dish from one edge to the other. Use a fork to press the pastry to the edges of the dish and cut 2-3 small slits into the top of the pastry. Brush the pastry with a little melted vegan butter and place the pie in the oven for 30 mins or until the pastry is risen and golden brown.